MCD reported earnings per share (EPS) of $1.09 for the quarter. That missed analysts' estimates of $1.37. Last year, McDonald's had Q3 EPS of $1.52. Net income was $1.07 billion – down from $1.52 billion last year. That's a year-over-year decrease of nearly 30%. Revenue was also down dramatically, at $6.99 billion from $7.32 billion last year. Analysts expected $7.18 billion. Analysts expected this summer's meat supplier crisis to negatively impact MCD's bottom line, but the results were even worse than anticipated. The company had a PR nightmare when a Chinese supplier was caught selling expired meat to McDonald's and other fast food chains. Same-store sales in the APMEA (Asia, Pacific, Middle East, Africa) market fell 9.9% in the quarter. Operating income in the region was down 55%. But that wasn't the only struggling market. Comparable sales in Europe also dropped 1.4%. Company officials said the main culprits were ongoing weakness in Germany and the "operating environment" in Russia and Ukraine. The stateside numbers were bleak as well. Comparable sales decreased 3.3% due to increased competition. Officials expected a U.S. drop of just 3%. Part of McDonald's problem is that many believe its options don't appeal to the Millennial generation. Instead these consumers prefer fast-casual chains like Chipotle Mexican Grill Inc. (NYSE: CMG). "I think they're still losing share," Telsey Advisory Group's senior analyst Peter Saleh told CNBC. "[Millennials] are moving toward higher quality, naturally raised food and McDonald's just isn't resonating with that younger crowd." "McDonald's Experience of the Future" is an attempt to elevate the menu and experience of customers with new technology and service enhancements. MCD wants to improve the "look, feel, and convenience of the McDonald's experience." "Digital Strategy" will simplify the customer experience through ordering, payment, and mobile offers. This includes the introduction of Apple Pay from Apple Inc. (Nasdaq: AAPL). "Resourcing for Growth" is a review of the company's use of resources "that will support the Company's key long-term growth initiatives." While the need to rejuvenate the McDonald's brand is obvious, today's three-step plan falls short. Investors did not feel inspired, and MCD traded in the red mid-day. 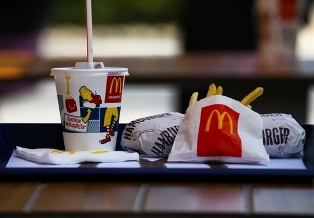 MCD stock is down 6.1% in 2014, and the outlook for the fourth quarter isn't bright. Chief Executive Officer Don Thompson said the struggles are expected to continue through 2014.